Oil painting of the Great Fire seen from Ludgate, c16701678. Originally black with dirt, the painting was restored by William Jones c1910, revealing this vivid Great Fire scene. Quotes from commentators of the day, with details about the fire and its’ times on the walls of the exhibition add insight as you metaphorically, make your way back, along the narrow lanes of the old City of London. On the soon to be charred, at least in our imaginations, opening corridor, with its incidental sounds of everyday life, circa 1666, one quote stands out. ‘…fire, fire, doth resound in the streets. Many citizens start out of their sleep, look out of their windows…’ Thomas Vincent 1667. The blaze started at 1 AM, so it must have seemed like a nightmare to those awakening to it. 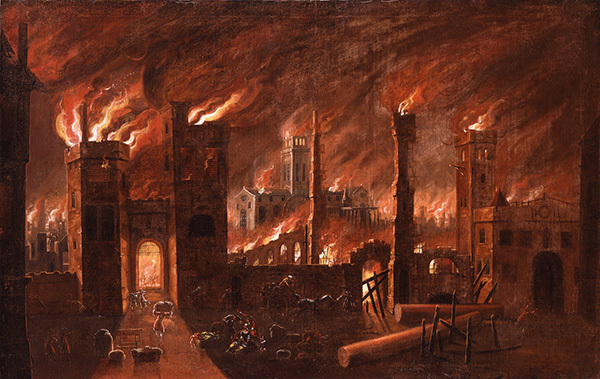 Once the deadly flames took hold, the capitol burned for over four days, fire raging through its quarters, literally gutting the Medieval sections within the Roman wall, and moving towards, but not quite reaching Westminster and the Tower of London. As it raged on, many inhabitants were forced to the Thames, into fields or out of the City altogether. Ultimately, n its aftermath, 100,000 people were left destitute and homeless. Pepys himself noted the rapidly arching progress of the Fire on the night of September 2, 1666, and it ‘made him weep to see it.’ ‘…we to a little ale-house on the Bankside, over against the ‘Three Cranes, and there staid till it was dark almost, and saw the fire grow; and, as it grew darker, appeared more and more, and in corners and upon steeples, and between churches and houses, as far as we could see up the hill of the City, in a most horrid malicious bloody flame, not like the fine flame of an ordinary fire.’ The details of London life that Pepys recorded (1660-69), finally published in the 19th Century, continue to add invaluable insight to our understanding of his times to this day. One hundred years after his night of horrified fire-watching, the pub Pepys stopped in with his friends would itself, be destroyed by fire, later to be replaced by the well frequented, multi-roomed Anchor and Bankside Pub of today. In hindsight, the disaster inspires many questions, among them, what London was like before the blaze. A map by Wenceslaus Hollar demonstrates that, enabling blanks to be filled in, mentally, at least, but not until we, in a manner of speaking, walk through the flames themselves, to their aftermath. Along the way, we pause, at a large scale black and white panorama by Hollar illustrating the burnt out devastation. Finding out what happened in the days, months and years following the disaster helps expand awareness of a subject that though common knowledge, actually had many more sides to it and consequences, than most people may have formerly realised or even considered. Given the business of modern life, most people may tend to take history for granted, content to chew on bite sized morsels. But here, the Museum of London has served up a veritable banquet of information to feast on, offering much to look, listen to, learn about and, contemplate, long after we’ve left the scene. Map showing the spread of the fire across 436 acres. 13,200 houses were burnt down and around 80-100,000 people were made homeless. Along the way, viewpoints abound, most frequently among them, from Samuel Pepys, who wrote much about the Fire and its resulting dramas from the perspective of one experiencing it: ‘the streets full of nothing but people and horses and carts loaded with goods, ready to run over one another and removing goods from one burned house to another.’ September 2, 1666. The National Portrait Gallery has kindly lent its’ seminal painting of Pepys, rendered by John Hayls, for which Pepys paid the then kingly sum of fourteen pounds, money well spent, befitting as Cambridge graduate, who would go on to serve as Justice of the Peace, MP and Chief Secretary to the Admiralty, under both King Charles II and King James II, respectively. To round out the picture, there are also stories from various members of the populous, telling what was experienced when and where. Some, you can listen to, via actual accounts read by actors vividly reliving details, with the letters themselves in cases below. Artefacts such as stone pub signs, replacements for swinging, wood counterparts destroyed in the blaze, lend atmosphere, as do costumes of clothing from the period, meant for children to try on and experience. As I moved through the exhibition, I couldn’t think of one angle that was missed. Although I was looking forward to seeing the exhibition, I never expected learning about the Great Fire to be fun, considering that the subject matter is, factually, grim. Happily, I was wrong, for as I moved between the adult and children’s portions of the exhibition, running parallel, alternatingly enlightening myself by admiring some very detailed paintings of the Great Fire, collecting facts and considering angles, on a child’s level, I also, interacted, with over-sized magnifying glass and fire damaged brick, and learning how to fire-fight in the style of the day, via a computer game with pictorial examples of various 17th Century pieces of equipment, among other optional diversions. So involved was I with timely phenomena, that by the time I got to a room boasting a large depiction of the Great Fire itself, rising up on a wall, I felt justified in basking before its flickering flames, lingering on a bench as it repeatedly re-animated the swiftness and scale of the blazing inferno. 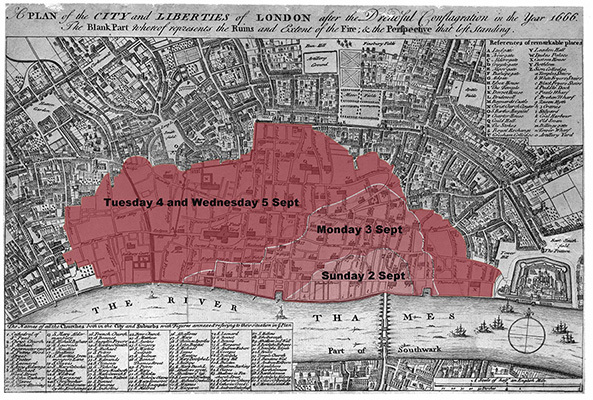 In its early hours, Lord Mayor of London, Sir Thomas Bloodworth, having witnessed the blaze, didn’t view it as a threat. In the thick of the inferno however King Charles II himself is said to have joined his subjects, throwing buckets of water at the flames alongside of them through the course of an entire night. The King’s younger brother, James was in charge of overseeing the extermination of the fire, which nearer its end, saw those actively fighting it resorting to gun powder in order to bring down houses in its path in hope of preventing it spreading. Notably, any and all illustrations and animations in this exhibition are entirely in keeping with their times, in that they, thankfully, appear to stem from what was the norm then, rather than any techno tricks from our own time that might jar. Less is, definitely, more, in that the resulting charming simplicity enables us to better understand the times of the unfortunate fire victims. That said, rather amazingly, to my relief, I noted that only ten people were reported to have lost their lives in the horrific disaster, despite the fact that a quarter of London as it was then, was destroyed. Granted, many historians feel that such fatalities among the poor in those days were often unreported. Progressive developments in relation to fire fighting are in evidence in the large section relating to the disaster’s aftermath, the centre-point of which is a faithful reconstruction of a seventeenth century ‘fire engine’, specially undertaken for the Museum of London by Croford Coachbuilders, the only master craftsmen up to the job in this country. The actual seventeenth century barrel like midsection of a fire engine with a metal tube in it, originally created by London’s John Keeling around 1678 all that remained of the 17th Century engine, had already been on display in the Museum for some time. The lovingly recreated apparatus assumes a fond, almost wistful air, ineffectual as it was for its large size, only being capable of squirting six pints of water at a time! In some cases, as in that of St. Dunstan’s Church, people-power aka school boys armed with then commonplace, leather buckets, saved the church from total destruction. Already well known at the time of the Fire, for Christopher Wren, (knighted in 1673), the rebuilding of London Churches became something of a life’s mission, especially as Wren was involved in the rebuilding of fifty-one parish churches, in addition to St. Paul’s! Thirty three at the outset of this huge project, he was seventy nine by the time the ‘new’ St. Paul’s Cathedral was completed. Wren’s knowing portrait, circa 1690 by John Closterman, lent by The Royal Society, graces a wall here, almost making it seem as though Wren himself were overseeing and no doubt, approving of, visitors’ open appreciation of this evocative exhibition. Typically, in the aftermath of the inferno, blame was cast by many people on the ‘other’, i.e. Protestants blaming Catholics, and/or people in general suspecting the Dutch or French of enacting plots to destroy London, as Britain was then at war with both countries. Also noted here is the birth of new industries and institutions, such as fire insurance and a much needed Fire Court to help protect those renting homes from inevitably greedy landlords. Which, made one feel a kinship with our ancestors who may have lived differently, in terms of habits and dress, but, by all accounts, seemed to have more in common with people living today than previously thought. Crime and chicanery were also rife in the aftermath of the blaze, as Pepys and many other observers and unfortunate victims of scams and thievery noted. Sadly, several accounts of such treachery can be heard and read about here, one example being the cost of hiring a cart to attempt to save one’s worldly goods, which, more often than not, doubled, if not sky-rocketed. 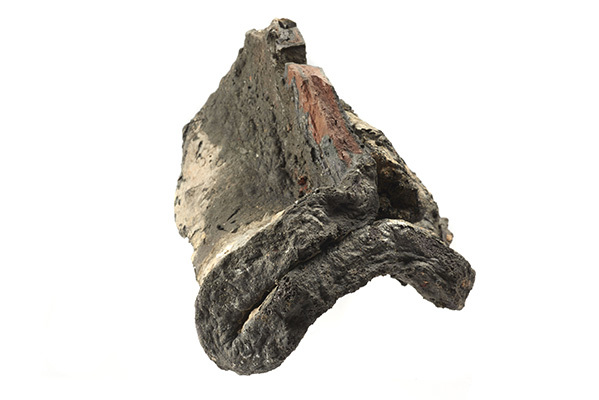 Burnt remains of the Great Fire are still discovered today during building excavations. Precious objects, were lost to the flames and reshaped, along with melted, mishappen keys, coins, padlocks, roof and floor tiles and a variety of other artefacts some on show, tangible evidence of the overwhelming power of the Great Fire! Blackened and warped ceramic roof tile which should be flat and terracotta in colour has been bent in half by temperatures over 1500oC. Rebuilding London itself took forty years, St. Paul’s Cathedral, from 1675, when building began, to the completion of Wren’s masterwork in 1708. As luck, or, fate would have it, plans for Wren to add a dome to the Cathedral were agreed to only a week before the Fire. Out of old London's ashes would rise the buildings of brick King Charles II had long hoped for, but many citizens would be homeless, some apparently, for up to eight years! In the circumstances, even though it was permitted for those living in houses to rebuild upon the same spot, a fee, equivalent to fifty pounds today, was required before foundations could be surveyed and building work could begin. An atmospheric section of the exhibition, where visitors can sit on covered boxes with silhouettes of displaced townspeople on the walls around them, and effectively, listen in on stories being told aloud of what citizens, rich and poor went through in the time after the fire, when many lost everything, brings those trying times to life and makes you feel especially thankful for all you have. Near the end of our visit, we took a walk through the entire exhibition once again, re-tracing the trajectory of the flames and their charred aftermath. It is a trip back in time not to be missed! 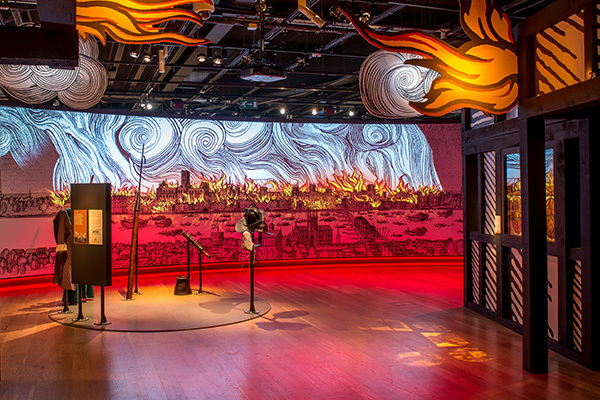 September 2 – 6, 1666, are dates that historically speaking, ‘will live in infamy’ forevermore, and, within the flaming hollows of your well fanned imagination as well, thanks to Museum of London’s thoughtfully staged, atypically thorough, ever fascinating exhibition, Fire! Fire!